I’ve just read an illuminating blog about David Munrow by Margaret Jones at Cambridge University, where a new display has opened to commemorate the 40th anniversary of Munrow’s untimely death on 15th May 1976. 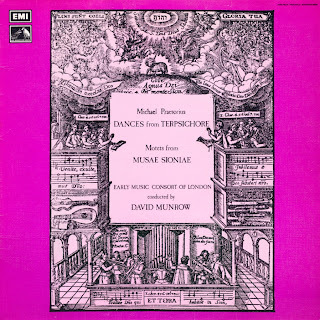 The Academy’s Library is fortunate to house the David Munrow Archive – a performance-centred archive, primarily of sheet music from performances given by Munrow’s Early Music Consort of London. I remember being part of the ‘purchasing team’ from the Academy when this went to auction in the early 1990s. Jeremy Summerly and I couldn’t believe our eyes – and, actually, Iaan Wilson (one of Munrow’s playing colleagues) was there too, picking out his parts from seminal recordings and shows. The archive also contains scores and arrangements for television and film productions, and some radio scripts. You can browse an online catalogue of the materials in the National Archives. The Academy’s Museum collections also contain percussion instruments used by the Consort, donated by the late Christopher Hogwood, who was an undergraduate with Munrow at Cambridge. Another very recent addition to our collections is a crumhorn owned by Munrow, donated by current Governor John Willan, who was his record producer. We should be grateful that so many of Munrow’s work was in radio and television – there is surely no other musician whose professional activities, more than a generation ago and in total spanning less than a decade, are so well documented. His BBC Radio 3 show ‘Pied Piper’ was aptly named, given his ability to infect others with his enthusiasms and fascinations. His innovative work in education – including as a recorder professor and class teacher in Medieval and Renaissance music at the Academy – remains an inspiration. ‘He probably did more than any other single person to popularise early music and to move period performance into the mainstream’, says the Cambridge University blog, and I know that many at the Academy would agree.